Prototype: German State Railroad (DRB) class CidT "Kittel" design steam powered rail car with the road number "4 Karlsruhe". 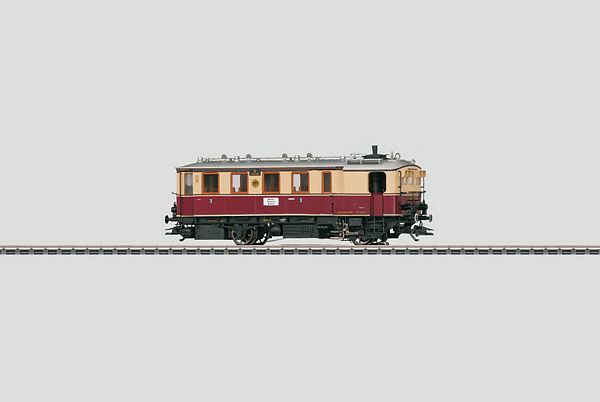 Built starting in 1915, originally for the Grand Ducal Baden State Railways. The rail car looks as it did in Era II in the typical red/cream paint scheme for powered rail cars. The car looks as it did at the end of the Thirties. Model: The car has an mfx digital decoder. It also has a controlled miniature can motor. The frame is constructed of die-cast metal. 2 axles powered. The dual headlights change over with the direction of travel. The headlights are maintenance-free, warm white LEDs. The car has NEM coupler pockets. It also has many separately applied details. There is a clear view through the area of the engineer's cab, and the car has a reproduction of the boiler. The headlights will work in conventional operation and can be controlled digitally. Length over the buffers 13 cm / 5-3/16". Tooling change: version with gas lighting.